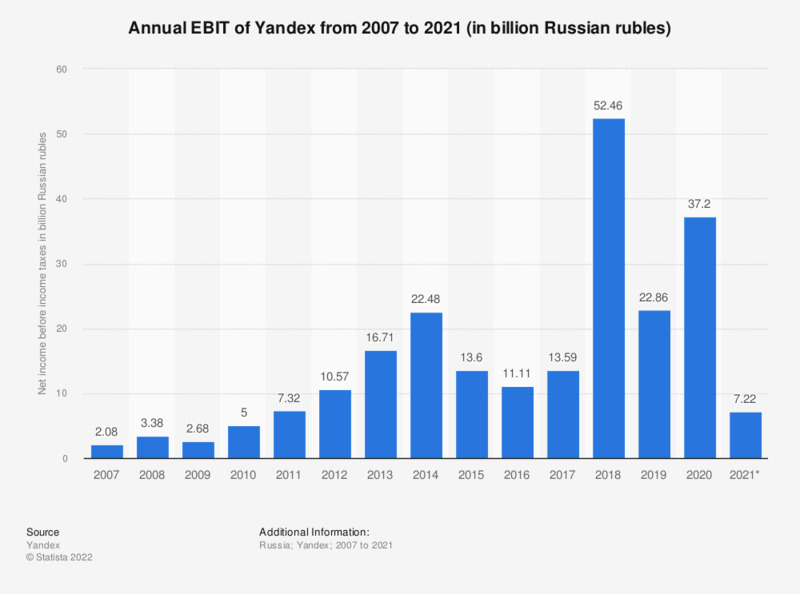 This statistic displays Yandex's net income before income taxes from 2007 to 2018. In 2018, the Russian search engine's net income before income taxes amounted to 54.46 billion Russian rubles or approximately 784 million U.S. dollars*. In the previous year, the Moscow-based company's net income before income taxes amounted to 13.59 billion rubles. * Pursuant to SEC rules regarding convenience translations, Russian ruble (RUB) amounts have been translated into U.S. dollars at a rate of RUB 69.4706 to $1.00, the official exchange rate quoted as of December 31, 2018 by the Central Bank of the Russian Federation.